Utility player Alex Foster has come in for praise from his head coach at Castleford Tigers. 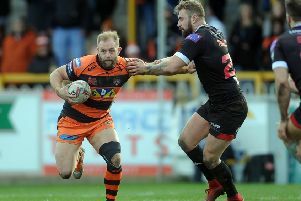 The 24-year-old is continuing to fill several positions for the Tigers - starting at loose forward then switching to centre following Greg Eden’s injury at Huddersfield last Sunday. His first game of the season was at prop and the ex-Leeds and Featherstone player is clearly proving his worth to the club. Powell is delighted with the man he brought to the club last year. He told the Express: “Alex Foster’s playing outstanding rugby league. “In terms of effort and toughness he’s been superb so far this year and he was good at Huddersfield. “I thought Jake Trueman was good again. He got a lot thrown at him and handled it really well.